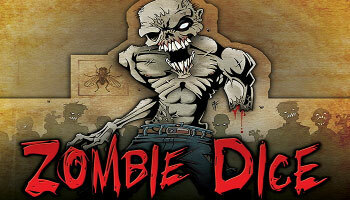 Zombie Dice is a "press your luck" party dice rolling board game where players represent zombies who wants braaaaaains. players has to shake a cup containing 13 dice (your victims) and randomly select 3 of them without looking into the cup and then roll them. The faces of each die represent either: brains, shotgun blasts or runners. Push your luck to eat as much brains as possible but be watch out because that shotgun blasts the end of your turn. When you rolled three shotgun, it is over for you and you get no points. Rolling a runner means that the player can roll that same dice if they choose to press their luck. Try to reach as first player 13 brains. The first player is the one who won the last game, or the one who can say "Braaaaains!" with the most feeling.